Lightning, momentary high-voltage faults, highvoltage switching, and numerous other "events" in power distribution networks frequently interrupt the continuous flow of power to frequency inverters. In most cases, these outages are short, one or two cycles (17 to 33 msec), and are generally undetected. But even these short interruptions can create serious problems in critical processes such as winding, unwinding, processing fine filaments, and mixing critical compounds. In unprotected applications, interruptions of a few milliseconds may cause a frequency inverter to shutdown then go through a restart procedure. This disruption can be costly because of lost and damaged product produced during a shutdown and restart. In addition. some unexpected "events" can present safety problems. You can avoid these problems by equipping the frequency inverter with some form of ride-through capability. In many critical installations, avoiding just one unplanned outage may pay for the investment. 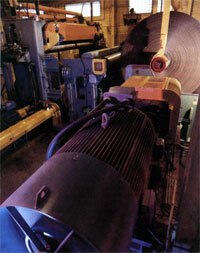 Critical winder - one of many types of applications that require power ride through to sustain proper operation. Interruptions to electric power are usually cause by two types of actions: planned and unplanned. For maintenance, line de-icing, and many other reasons, it is common practice for electric utility personnel to make planned grid changes, that is switch the main feeder circuits from one grid to another. During this planned switching process, your power may dip some or a lot for two to four cycles (33 to 67 msec). This goes unnoticed in most operations, although the lights may give a slight flicker. However, such an outage may be costly for some operations that use solid state controls, including frequency inverters. Generally considered uncommon, some planned grid changes produce outages lasting 12 to 20 cycles (200 to 333 msec). These durations present new challenges, the magnitude of which depends your process. Unplanned outages, typically caused by lightning, wind storms, and equipment failure, often last a few seconds to several minutes. There are two methods for determining the severity of such interruptions. One is to get the information from the power company. Some companies will give the information willingly, others will not. If this fails, you can use a power line monitor to record interruptions with the time and magnitude of each occurrence. Such instruments can be rented from firms specializing in these devices. To overcome the problems cause by these interruptions, you can purchase frequency inverters with a wide range of ride-through capabilities. In many respects, selecting the capability needed is similar to selecting an insurance policy — you optimize the need-cost relationship. Two major types of equipment are available for sustaining process operation. The uninterrupted power supply (UPS) can be sized to maintain an ac power supply for several minutes. This method, Figure 1, uses rectified incoming power to maintain a charge in a large battery. This, in turn. supplies power to an inverter that produces constant-voltage, constant-frequency single or three-phase power. This power flows independently of the ac line as long as the battery has sufficient charge. Alternate methods rely on stored magnetic or mechanical energy (see boxes). 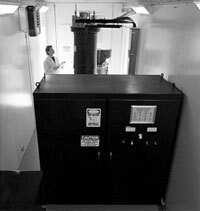 These rather expensive systems are often installed with computers and frequency inverters on critical systems and processes that justify significant "insurance." For shorter interruptions — in the millisecond and second category — ride through capability is relatively easy to include in PWM (pulse-width modulated) inverters, ac or dc. Generally speaking, any inverter that uses a fixed-voltage dc bus between the rectifier and the final power section that converts constant-voltage dc to adjustable- voltage ac or dc can offer some type of ride-through capability, Figure 2. It is in the filtering section that extra capacitors are added to prolong the presence of a dc voltage, if the ac power should fail. The amount of capacitance determines the duration that a sufficient voltage can be maintained for a given load. The more the capacitance (microfarads), the more the stored energy. Of course, the more the load, the faster the stored energy is consumed. 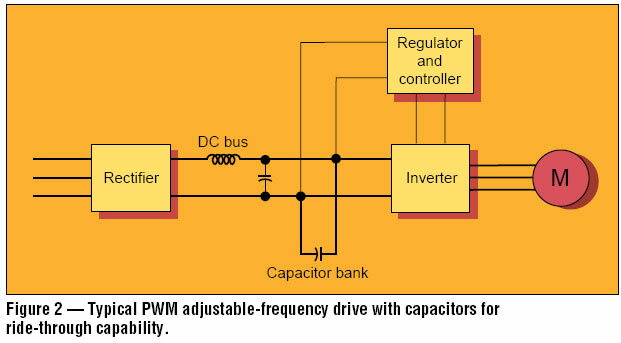 In most frequency inverter designs, power from this dc bus feeds two sections: power for the inverter section, and control power (an ampere or two) for the regulator and control circuits. Also, by using a regenerative inverter, a decelerating, high-inertia load can transfer energy to the dc bus, thus increasing the time that the bus maintains sufficient voltage to maintain control power. To prevent attempted operation while a dc bus voltage is too low for proper operation, most PWM frequency inverters have an undervoltage trip circuit that shuts the frequency inverter down, in a safe sequence, when the dc bus voltage dips to a specified level. Should the frequency inverter operate when the dc voltage is below the specified level, the inverter section would be unable to maintain the required volts per Hertz, a condition that can damage both the inverter and the motor. For frequency inverters other than PWM, the UPS is usually the only workable solution; because, for example, in the six-step inverter design, the dc bus voltage changes with the required motor speed, unlike the PWM that uses a constant dc bus voltage. To specify the proper unit, first consider the details of the machine operation in terms of functions and the sequence of a shutdown after a momentary power outage. Also, consider safety aspects if the machine coasts or restarts. How about controls for lubrication and other vital functions that must be activated before rotation? When do they drop out? Pickup? Machine accessibility for clean up and restarting is another factor. After all the possibilities, probabilities, magnitudes, and costs have been established, contact a frequency inverter supplier and define the requirements. Industry’s need for uninterrupted electric power is opening doors for research and new products. One such product, developed by Superconductivity Inc., Madison, Wis., is a Superconducting Storage Device (SSD) that stores 500 to 2,500 kW-sec of energy. The smaller one will, for example, deliver 500,000 watts for 1 sec, (or 100,000 watts for 5 sec) should the electric power fail. The helium-cooled SSD units store energy in superconductive rings. They supply power in much the same way as less-expensive battery backup units do, although the SSD reportedly occupies much less space than does an equivalent battery unit. Responding to outages as short as 2 msec, the units are designed for applications such as paper machines, semiconductor manufacturing, syntheticfiber spinning, precise metal heat-treatment facilities, plastic blown-film lines, and related processes where any disruption is costly. Squirrel-cage motor (right) powers 3-phase, 60-Hz alternator (left). Control cabinet is not shown. A single, high-inertia unit that combines a three-phase motor and a special three-phase alternator can deliver rated power for 15 to 45 sec, even if the alternator is operating below the rated speed. A controller senses the alternator rotor speed and controls the number of poles in the alternator section. In addition to offering complete electrical isolation between the electrical input and output, the unit avoids distorting the utility-supplied input power with the harmonics frequently associated with solid-state devices, and it delivers pure sine-wave power to the connected load. One installation that relies on this system is the Home Sports Entertainment TV Network in Houston. This facility handles hundreds of sports programs and can not afford even a short interruption. Thus, HSE selected four, 35 kVA-units made by Precise Power, Bradenton, Fla., to fill any gaps in the electric power supply until a 350 kVA diesel-powered unit gets up to speed and on-line. Pumping applications can be a special problem if the pump output is above the pump. It is all too common for a pump to stop; the fluid flows down, which is opposite of the normal flow, forcing the pump rotor to turn backwards. When a start command turns an inverter on, the pump motor is rotating in reverse, the motor current shoots up, and the frequency inverter trips off because of the excessive current. To overcome this problem, some frequency inverters contain an optional circuit that first senses the pump direction and speed then applies just enough current to slowly stop the motor and start it turning in the proper direction. Such a circuit can be included in a ride through control scheme to prevent a current-limit trip during restart. Much of the information in this article was supplied by application and development engineers in the following companies.